For several years in the mid-to-late 00s, Marmol was one of the most feared relief pitchers in the game. His slider was so nasty he made batters look absolutely foolish. It was largely on Carlos’ arm that the Cubs dashed into the playoffs in 2007 and 2008, and it clearly wasn’t his fault they were swept. Still, as nasty as Carlos could be, he also had a tendency to be very wild. It was not uncommon at all for Marmol to walk the bases loaded before striking out the side. 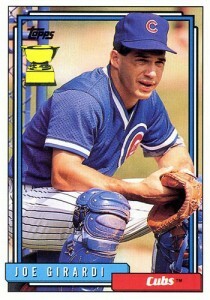 He saved over 100 games in a Cubs uniform, but it was a wild and bumpy ride. The Cubs finally had enough of the roller coaster in 2013, and shipped him off to the Dodgers. Shamsky was part of the Miracle Mets team that kept the Cubs out of the playoffs in 1969, but just a few years later he was wearing a Cubs uniform. The outfielder/first baseman was used in only 15 games, almost exclusively as a pinch hitter. He hit only .125 in that role before being released. Ed was born in Berlin, Germany, but came to America as a boy. When he joined the Cubs (then known as the Colts), he was still only 18. If you want to see Ed pitch in a Chicago uniform, set the wayback machine to May 2, 1890. He pitched two innings and gave up seven runs. He never pitched for Chicago again. Poorman was part of the 1880 champs. He played in right field for seven games, and hit .200. He later pitched Toledo, Boston, and Philadlephia. Hugh T Casey pitched 13 games for the Cubs during their NL Pennant winning season of 1935, then spent the next four years in the minors. In the minors they tried to get him to harness his wildness to no avail. One of his friends, Whitlow Wyatt, described Casey this way: “He was a real good friend,the nicest guy you would ever want to meet. But on that mound, Hugh Casey had a mean streak. He just as soon knock down a hitter as look at him.” The Cubs shipped him off to Brooklyn, and he eventually made it back to the big leagues with the Dodgers. Casey even won 15 games for them in 1939—and made the all-star team. But the war came along shortly thereafter and Uncle Sam came a calling. Casey served in the military during the war, and when he returned, they converted him into a reliever in 1946. That’s where he got his nickname “Fireman.” On July 3, 1951, less than two years after his last appearance in the majors, he committed suicide following years of heavy drinking and womanizing. He was just 37 years old.